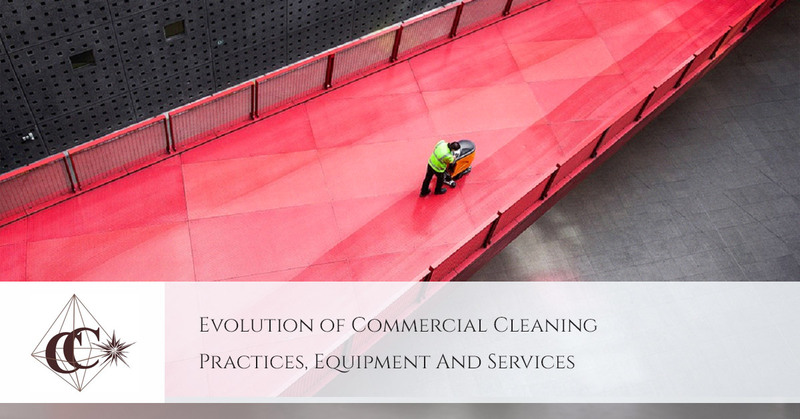 Evolution of Commercial Cleaning Practices, Equipment And Services | Crystal Clear Enterprise, Inc.
Commercial cleaning has always been important for a business. Whether you manage a factory or a superstore, ensuring proper cleaning remains a necessary part of the job. But service providers and cleaning methods were not always the same. In fact, with time and technologically, everything has improved for the better. Initially, only huge privately-owned companies were hired for service. However, the atmosphere has changed and locally owned companies are now increasingly valued. Superior cleaning, friendly staff and quick adoption of newer solutions are some of the few reasons for this change. Equipment and cleaning supplies have changed significantly from what was being used some 20 to 50 years ago. Advanced commercial cleaning methods require top notch equipment and environment friendly ingredients. No other area has perhaps seen more change than carpet cleaning. Google ‘commercial carpet cleaning’ and you’ll find an array of methods currently employed by companies. Even at Crystal Clear, we offer five different carpet cleaning solutions. Newer solutions have improved effectiveness. They have led way to safer and easy-to-use chemicals. These technologies are cost-effective and have less impact on the environment. We all know that cleanliness isn’t just about the appearance. It’s true that clean facilities leave a better first impression. But it also boosts safety and hygiene. While hygiene has always been an important focus area of commercial cleaning, nowhere in history has it been more important than today! It’s necessary for businesses to follow safety regulations imposed by various governmental and non-governmental organizations. Our professional cleaning company doesn’t offer services through untrained employees. We have trained staff for each of our service categories. They’ve been trained to work with the relevant equipment, so they can offer you tailored services. By offering janitorial, floor care and office carpet cleaning services, our company can provide an individual cleaning regimen for your commercial space. We’re not in it to just earn a paycheck; we want to make a difference by helping you improve the aesthetic of your work environment. To request any of these services, just dial 816 763 3353. We’re one of the leading cleaning agencies in Kansas City; you won’t be disappointed!